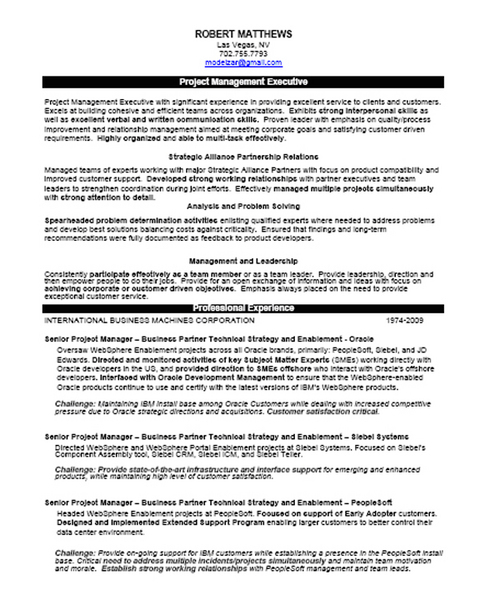 Project Management Executive with significant experience in providing excellent service to clients and customers. Excels at building cohesive and efficient teams across organizations. Exhibits strong interpersonal skills as well as excellent verbal and written communication skills. Proven leader with emphasis on quality/process improvement and relationship management aimed at meeting corporate goals and satisfying customer driven requirements. Highly organized and able to multi-task effectively. Ready to step up and lead problem determination activities enlisting qualified experts where needed to address problems and develop best solutions balancing costs against criticality. Ensures that findings and long-term recommendations are fully documented as feedback to product developers. Emphasis always placed on the need to provide exceptional customer service and to address SERIOUS customer problems before they become CRITICAL. Managed teams of experts as part of IBM's Strategic Alliance with Oracle Corporation. Oversaw WebSphere Enablement projects across all Oracle brands, primarily: PeopleSoft, Siebel, and JD Edwards. Directed and monitored activities of key Subject Matter Experts (SMEs) working directly with Oracle developers in the US. Provided direction to SMEs offshore who interact with Oracle's offshore developers. Interfaced with Oracle Development Management to ensure that the WebSphere-enabled Oracle products continue to use and certify with the latest versions of IBM's WebSphere products. Achieved high marks for Customer Satisfaction. Provided technical guidance and facilitated information exchanges between IBM and it's Business Partner. Led technical discussions and oversaw negotiations for resolution of technical issues. Provided leadership and architectural guidance to various teams of data modellers, including teams from IBM Strategic Alliance Partners, to design and document a comprehensive data model for business management and software development. Designed and implemented data manipulation components of Software Code Repository Systems. Supported, maintained, and enhanced IBM's proprietary Software Code Library and Integration system for the IBM Kingston and IBM San Jose development organizations. Successfully enhanced and automated elements of the code integration and build processes to eliminate errors and re-work.